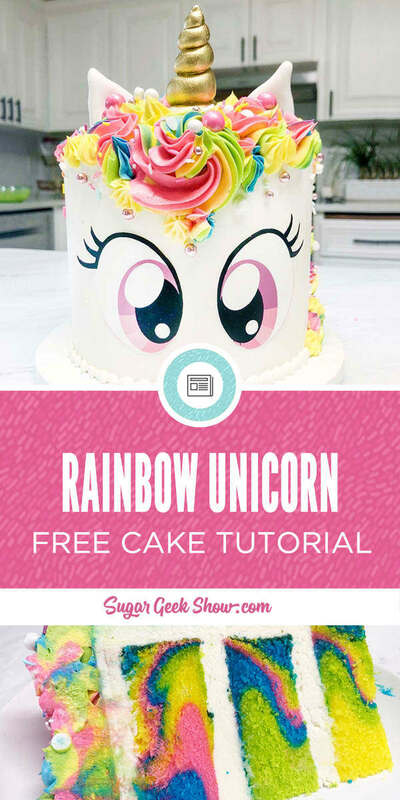 An easy rainbow unicorn cake that’s soooo cute! 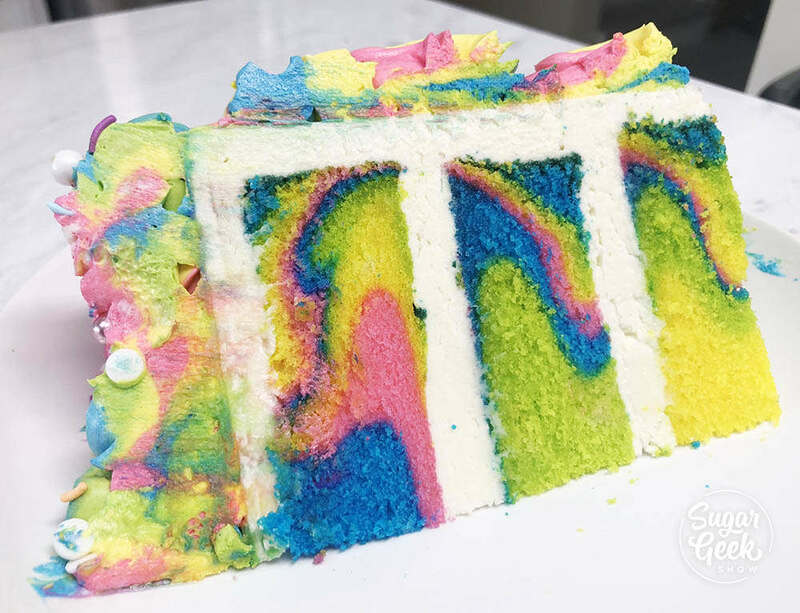 This unicorn cake is rainbow on the inside and outside! I love how pretty the rainbow cake batter turned out using my white velvet buttermilk cake recipe. 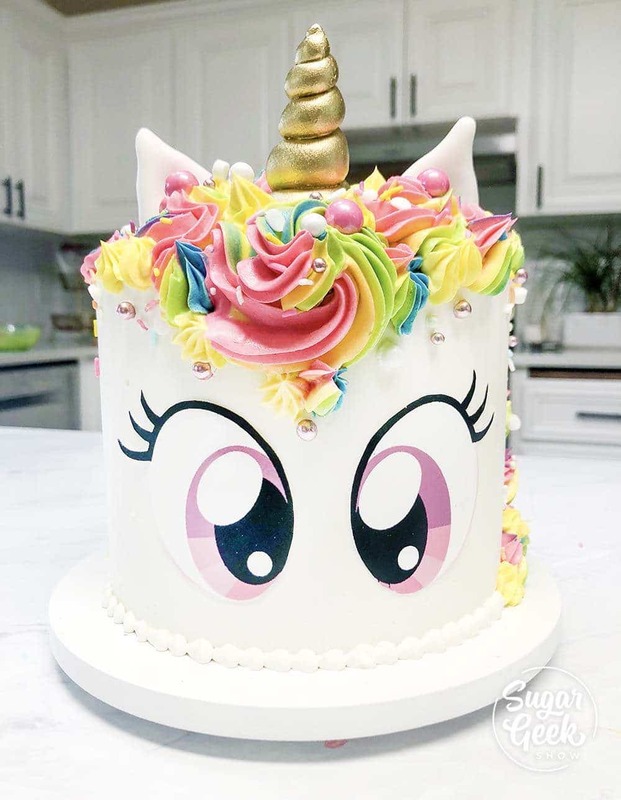 The rainbow buttercream mane topped with sprinkles and a pretty gold unicorn horn just makes this the cutest rainbow unicorn cake evah! Ok the first step, make the cakes. I whipped up a batch of my white velvet cake for this recipe because it tastes AMAZING but also is a very white cake so it takes the color really well. Other good options are the white cake recipe and WASC cake. Vanilla cake uses egg yolks so the batter tends to make the blue turn green. Combine remaining milk and oil in a separate measuring cup and set aside. Add your softened butter to the dry ingredients and mix on low until mixture resembles coarse sand (about 30 seconds). Add in your milk/oil mixture and let mix until dry ingredients are moistened and then bump up to med (setting 4 on my KitchenAid) and let mix for 2 minutes to develop the structure of the cake. If you don’t let your cake mix on this step your cake could collapse. Scrape your bowl and then reduce speed to low. Add in your egg white mixture in three batches, letting the batter mix for 15 seconds between additions. Scrape down the sides again to make sure everything has incorporated then pour into prepared pans. Divide batter into four measuring cups and color with 1/2 tsp of food coloring gel. I like Americolor electric colors because they are very bright. I used electric blue, electric green, electric yellow and electric pink. Mix until just combined. Spoon cake batter into your prepared pan. I did two spoon-fulls per color, starting with blue. Then green, then yellow then pink. I repeated my colors twice until the cake pan was about half full. Bake 30-35 minutes until a toothpick inserted into the center comes out cleanly but the cake has not begun to shrink yet from the sides of the pan. IMMEDIATELY TAP PAN FIRMLY on countertop once to release the steam from the cake. This stops the cake from shrinking. Let cakes cool for 10 minutes inside the pan before flipping them out. The cake will shrink a bit and that is normal. Flip onto a cooling rack and let cool fully. I chill my cakes before handling or you can wrap them in plastic wrap and freeze them to trap moisture in the cake. Thaw on the countertop while still wrapped before frosting. After my cakes are chilled, I stack and fill them with my easy buttercream recipe and smooth out the buttercream with a bench scraper. If you need more info on how to make a cake, check out my free tutorial on the basics of how to make your first cake. I don’t worry too much about getting the sides perfectly smooth but if you follow the last step in my easy buttercream recipe, you’ll have buttercream that is pretty much bubble free. I know most unicorn cakes have eyes that are closed and kind of piped very simply but I wanted to do something a bit different. I’m a big fan of my little pony and anime so I wanted my unicorn to have more expressive eyes. 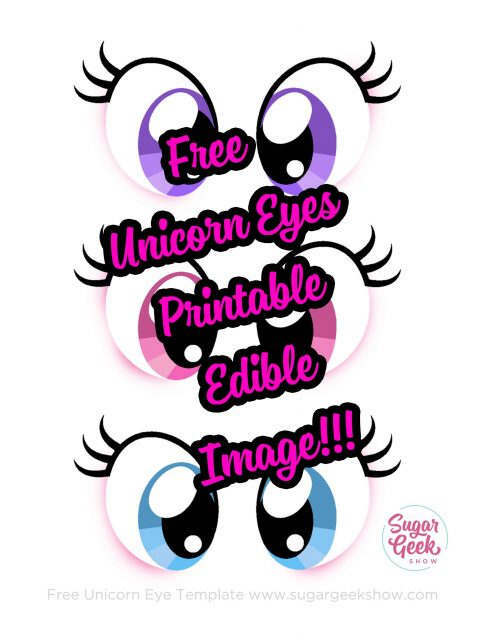 I designed these unicorn eyes that you can download and print out using your edible ink printer. I prefer my Canon MG6821 printer, Photofrost edible image sheets and edible ink. It hasn’t clogged on me once and I hardly ever print. Tips for printing edible images. Make sure your print settings are set to BEST QUALITY PHOTO and your paper is set to photo paper. Otherwise, you can get streaking and lines in your paper. Use fresh edible image paper that is flexible or it can be hard to cut out. Cut your images using cuticle scissors or an x-acto blade. Once your eyes are printed and cut out you can just place them onto the cake. I put mine towards the bottom of the cake so they look cute and cartoony. If you put them higher up, you won’t have room for the hair. You can get the free unicorn eyes edible image by clicking on the image below. The image will be delivered to your inbox. Now it’s time to put on the unicorn horn! I place my cake pop stick on top of the head and roll out some fondant into a snake. One end is much fatter than the other. Wrap the fondant snake around the cake pop stick so it’s nice and snug. Use your hands to fill in any gaps or holes in the fondant. If you don’t like how it looks, just pull it off and try again. Don’t get discouraged if it takes you a few tries. 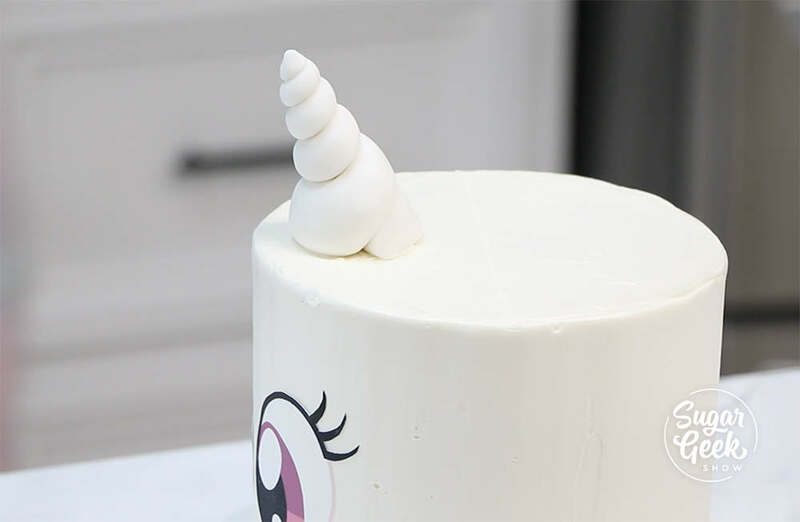 If you don’t want to fuss with fondant, you can use my friend’s awesome unicorn horn mold. 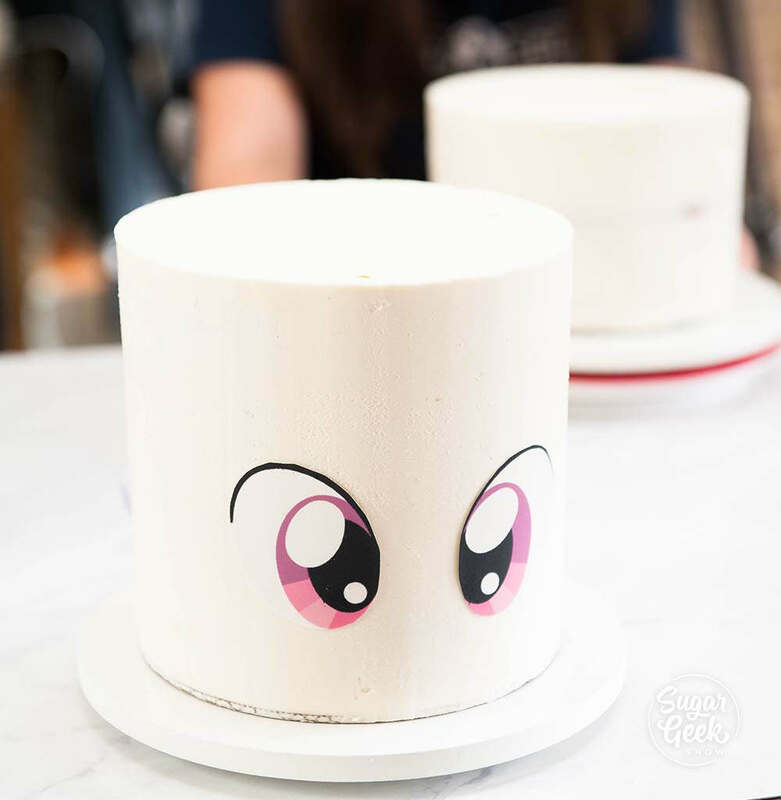 Fill it with chocolate or isomalt and you’ll have a perfect unicorn horn for your cake! Paint your unicorn horn with a mixture of TMP super gold mixed with a few drops of grain alcohol (I used Everclear) to make a thick paint. TMP is non-toxic. Other good brands of gold are edible artist decorative paints metallics. Now the fun part! Making the unicorn mane! I colored about 1 cup of easy buttercream for each color (electric blue, green, yellow and pink). Spread the buttercream onto a piece of plastic wrap (see video) to make a buttercream bullet. Place the bullet inside a piping bag with a 1M star piping tip and start making some rosettes! You really can’t mess this up and it’s what gives the unicorn cake it’s personality. I followed up the rosettes with a smaller star tip (not sure the size) and some yellow buttercream. Then I added on some sprinkles from Sweetapolita (affiliate link) twinkle mix for some extra magic! I used fondant to make my unicorn ears. Just roll some fondant into a ball and then flatten slightly to make a leaf shape. Cut in half to make two ears (see video). I hollowed out the center of the ear a tad and dusted the insides with some pink petal dust. 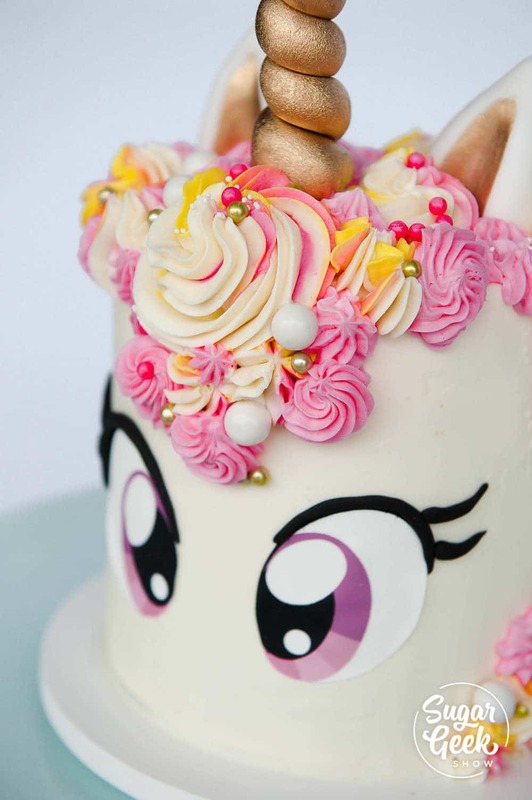 You can place the ears right on the buttercream and they will stick or you can insert a piece of dried spaghetti and use that to stick into the cake. Don’t use toothpicks, they are dangerous and can poke someone’s mouth. The last thing I did was pipe a small white border around the bottom of the cake with a #4 round piping tip and some white buttercream. You do not need to refrigerate this cake if you are eating it the same day. If you do refrigerate it, make sure you bring it to room temperature a few hours before eating it so the butter has time to soften and become delicious again.